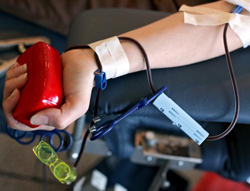 Blood will soon be shed on campus — but for a good cause. Student Life and the Oklahoma Blood Institute will host a blood drive 10 a.m. to 3 p.m. June 22 and 23 in the College Union, said Katie Treadwell, Student Life programs coordinator. Treadwell said the drive is the first of the semester. To give blood, donors must be at least 17 and weigh at least 110 pounds, said Lindsay Cobb, OBI representative. Cobb said she encourages donors to eat a substantial meal before giving blood. “We sometimes have people come in and say they ate a piece of toast for breakfast,” she said. OBI will supply free cookies, a T-shirt and a voucher for two Oklahoma City Zoo tickets to those who give blood, Treadwell said. Donors may forgo their T-shirts and OBI will instead use the funds to assist blood centers in developing countries. “It’s a chance to doubly give,” Treadwell said. For more information, contact Student Life at 405-682-7523 or visit www.obi.org .